View from the rooftop deck of the AMF-3 this morning. Note the giant snow drifts being produced by the wind behind the facility! We arrived on the north slope a week ago, and now have one week until we likely head home. Some campaigns go very quickly — this is generally the case when you are flying many, many flights or, alternatively, when your equipment is failing you and you are spending a lot of time and energy troubleshooting the problems encountered. This campaign, so far, has not moved quickly… Due to the winds, which picked up pretty much the day after we arrived at Oliktok, we have not been able to fly very much. This is not for lack of prepration, but the aircraft that we are here with are simply not up to the task of flying in winds that include 40+ mile per hour gusts. While we have done everything we can to be ready and get our planes up in the air, there is simply a limit to what can be attempted. Snow being blown across the tundra like sand in a desert. I guess it’s worth mentioning a bit about the preparation that went into this campaign. There have been a lot of people involved (by my count, nearly 30 (!) individuals have spent some significant amount of time over the past two years), with contributions ranging from building the data acquisition system for the Pilatus, providing airspace coordination, providing instrumentation, piloting the aircraft, deploying to the field for operations, coordinating shipments to Oliktok, etc., etc., etc… The list goes on and on. We have had many, many meetings, phone calls, e-mails (lots, and lots of e-mails), and conversations to ensure that we are as prepared as possible to accomplish what we set out to do. With all of that preparation, I guess the one thing that I did not do a good job preparing for is the emotional impact of facing a scenario where you will not be able to fly nearly as much as hoped for reasons that are completely beyond your control. In this case, that is the wind. Time will tell — we still have a week to go, but at the moment the forecast is not providing much reason for optimism. Repaired DataHawk number 77 (aka the FrankenHawk), ready for flight this morning. Despite all of this, we march on and do what we can. 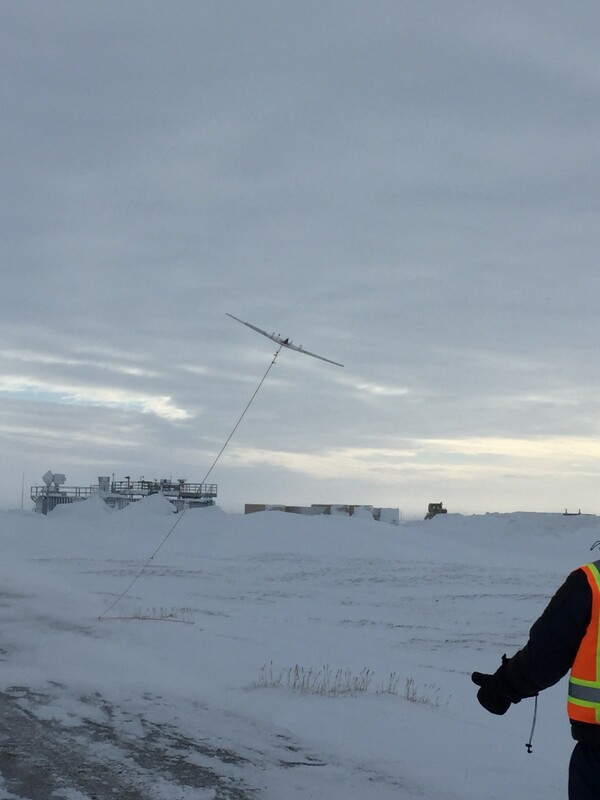 With Phillip and Gabe having successfully worked through the logging issues that we encountered yesterday, we consistently put POPS, our aerosol instrument, on the roof of the AMF-3 to collect additional information on the particles present here at Oliktok Point. Additionally, I had told the team that we would fly the DataHawk some more today if (and only if) the aircraft which suffered a hard landing yesterday was still operable. With a bit of work, the aircraft was ready to go this morning for another round of flights. DataHawk 77 taking off for the first flight of the day. The cord you see attached is the bungee used for takeoff. Note the size of the drifts that are starting to envelop the AMF-3! Doug (left) and Gijs (right) keep a close eye on the aircraft while it is under the guidance of the autopilot. If it looks as though we’re kind of leaning forward, that is because we were trying to remain upright in the winds! The winds today were certainly less than optimal, with measured windspeeds somewhere in the 25–30 mph range, with higher gusts. 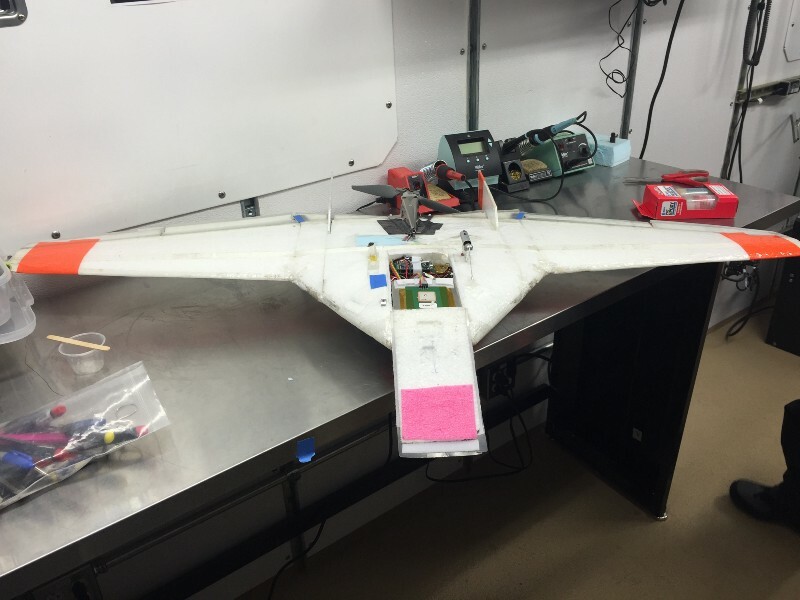 We launched the DataHawk twice, and ultimately had to very different flights. The first went really well — we were able to successfully complete a number of orbits using the autopilot, despite the windy conditions. While there were a couple of moments where very little headway was being made into the wind, ultimately we safely brought the plane back down and Doug executed a perfect landing in some very turbulent conditions. Again, we verified that 20 meters per second is approximately the top airspeed achievable by the autopilot at this location. The second flight started off similar to the first. 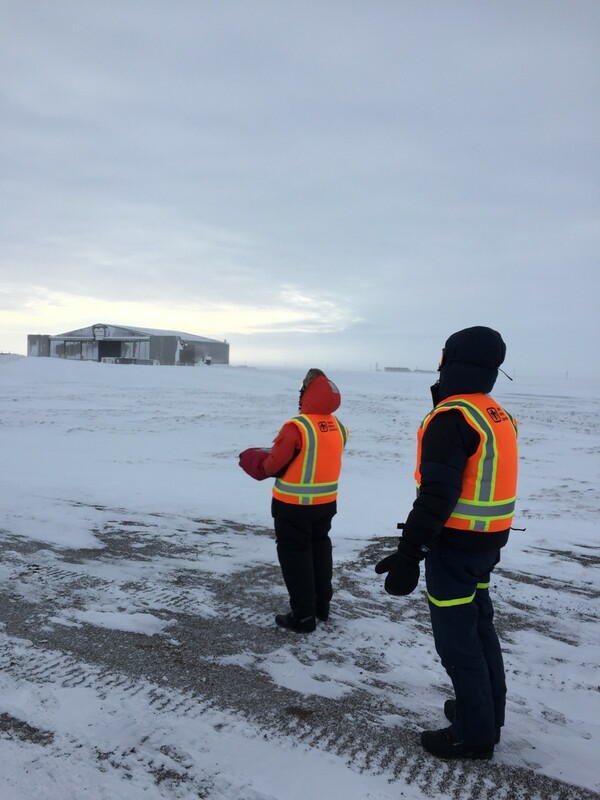 However, the aircraft again struggled to make headway into the winds, and Doug decided that he should try to bring the aircraft back under manual control to ensure that it did not end up blowing away. 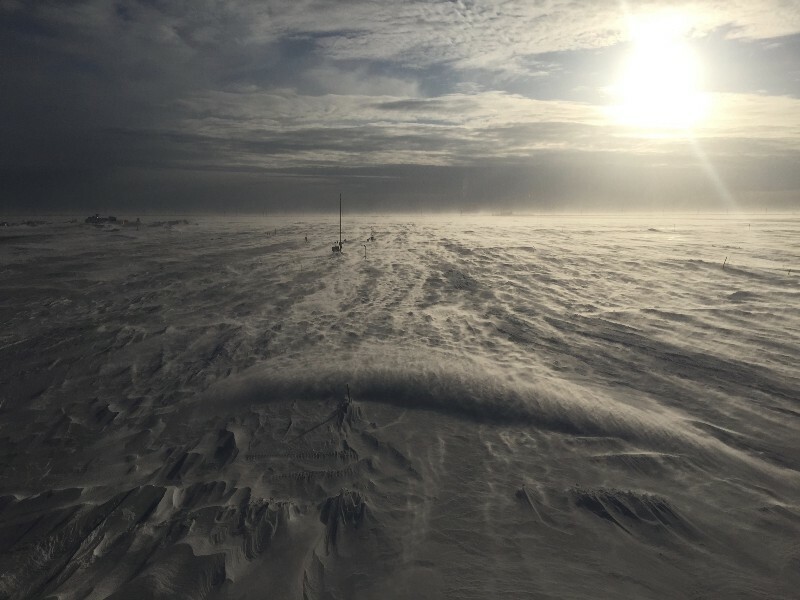 However, between the winds, flat lighting and poor visibility, that did not go very well and the aircraft impacted the frozen tundra with substantial force. The force was enough to take this aircraft out of the rotation for the remainder of this trip, and we will need to be a bit more cautious now, as we are down to only one DataHawk. Unfortunately this means that we will no longer be able to fly in marginal conditions as we did today, and for the next few days that seems to be all that the forecast is predicting. Let’s hope that the weather models are missing something and winds begin to die down sooner than expected!